Amazon announced that the Kindle Fire orders are shipping today, one day early. Many customers had expressed frustration on the Amazon forums that the device would first be available in stores like Best Buy on the 15th, yet customers who pre-ordered would not receive their Kindle Fires untill at least November 16th. Amazon has also announced that the two Kindle Touch versions, the Kindle Touch and the Kindle Touch 3G, , are shipping on Tuesday, November 15th, six days early. Some websites had already gotten early review devices and there were reviews up today on sites like MSNBC and Engadget. Look for a flood of reviews on the device over the next few days. In case you can’t wait, the official Nook Tablet demo video offers a tour of the new device. The Nook certainly dominated the ebook news yesterday. 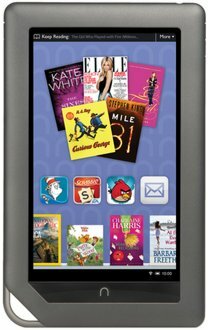 As expected, Barnes & Noble announced the Nook Tablet,which will be available on November 18. The Tablet will retail for $249. Here’s a link to a hands-on video from Engadget. Barnes & Noble has also reduced the price on two of its other readers. The Simple Touch will retail for $99. The Nook Color’s price will be reduced to $199. Both readers are also getting updates: The Simple Touch update includes improvements to the page refresh rate and the battery life. Here’s a hands-on video for the Simple Touch from Engadget. For the original Nook color, the new updates will add Hulu Plus, etc. And, if you find it confusing – Nook Color, Nook Tablet – here’s an article to help you sort it out. To help sell all the readers, Barnes & Noble is launching in-store Nook Stations! And, if all of that is not enough, Barnes & Noble announced that they will be launching an international Nook in the months ahead. Here’s the commercial for the new Kindle Fire. Disclaimer: I’ve gotta say, I know that feeling of anticipation and excitement when I see an Amazon box on the porch! Len Edgerly of The Kindle Chronicles will be live blogging for Kindle Nation Daily at http://bit.ly/LEN-LIVE-FROM-NY-ON-KTAB. CNET’s David Carnoy will be live blogging for the tech site at 10AM at http://reviews.cnet.com/8301-33198_7-20112398-286/amazons-press-event-wed-7-a.m-pt-live-blog/?tag=mncol;txt. Harry McCracken will be covering the event for Technologizer at http://technologizer.com/amazon/. BGR will be covering the event at http://www.bgr.com/2011/09/28/live-from-amazons-kindle-fire-tablet-event. Find any more? Please leave them in the comments.